In a fast-paced and unpredictable marketplace, strategic capability is invaluable. Strategic Purpose: Defining and delivering the “highest and best use” of an organization starts with crystal clear definition of vision, mission and values. SKILLSOURCE® has created a proprietary approach to defining organizational purpose as a “north star” for winning strategy. Contact us for an assessment of your needs and a detailed overview of our services. 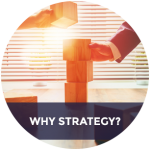 Strategy Snapshot: Most organizations consider strategy through the perspective of strengths, weaknesses, opportunities and threats. This offers helpful information about an organization, but SKILLSOURCE® goes further to identify the critical few insights that drive winning strategy. Contact us for an assessment of your needs and a detailed overview of our services. Planned Action: Strategy becomes significant through implementation. To make sure that good ideas become great initiatives, SKILLSOURCE® guides clients through a delivery approach that integrates marketing, sales, operations and finance into one streamlined, sustainable success. Contact us for an assessment of your needs and a detailed overview of our services. Strategy Certification: When an organization articulates a clear and compelling purpose, it aligns everyone involved. When that organization fulfills its purpose through winning strategy, it becomes certified by SKILLSOURCE® as a Purpose Powered® organization. Contact us for an assessment of your needs and a detailed overview of our services.